The SMS-PW surface-mount current sensing resistor series from Isabellenhütte offers SnPb tinned connections suitable for aviation and aerospace applications being ESCC 4001/027 qualified. Higher power ratings and low internal temperature rises due to the larger pad termination sizes. The Manganin® alloy resistance element has a resistance range of 0.005Ω to 1Ω TC of below 50ppm/K over the temperature range of (between +20°C and +60°C) and offers excellent long term stability. The SMS-PW model offers these capabilities in a 2512 chip size. Additional Features 2-terminal surface-mount resistor suitable for aviation and aerospace applications being ESCC 4001/027 qualified with SnPb tinned connections. Constant current up to 25A (0.005Ω), excellent long-term stability, applicable temperature range -65°C to +170°C and high pulse power rating. The SMK surface-mountcurrent sensing resistor series from Isabellenhütte offers the designer higher power ratings and low internal temperature rises due to the larger pad termination sizes. The Manganin® alloy resistance element with a resistance range of 0.005Ω to 0.5Ω, has a TC of below 50ppm/K over the temperature range of (between +20°C and +60°C) for resistance values of 0.015Ω or more and offers excellent long term stability. The SMK mod.. The SMK-R000 surface-mount series from Isabellenhütte offers a zero ohm 2-terminal power bridge / jumper with a 50A high current, and allows a track width of up to 1mm to run underneath. The Isabellenhütte SMK-R000 has a resistance value of less than 0.2mΩ with tin plated cooper terminals and enamel top and bottom2-terminal surface-mount power bridge / jumperConstant current up to 50A (DC Current)Resistance value of less th.. The SMS-R000 surface-mount series from Isabellenhütte offers a zero ohm 2 terminal power bridge / jumper with upto 100A high current, and allows a track width of up to 3mm to run underneath. 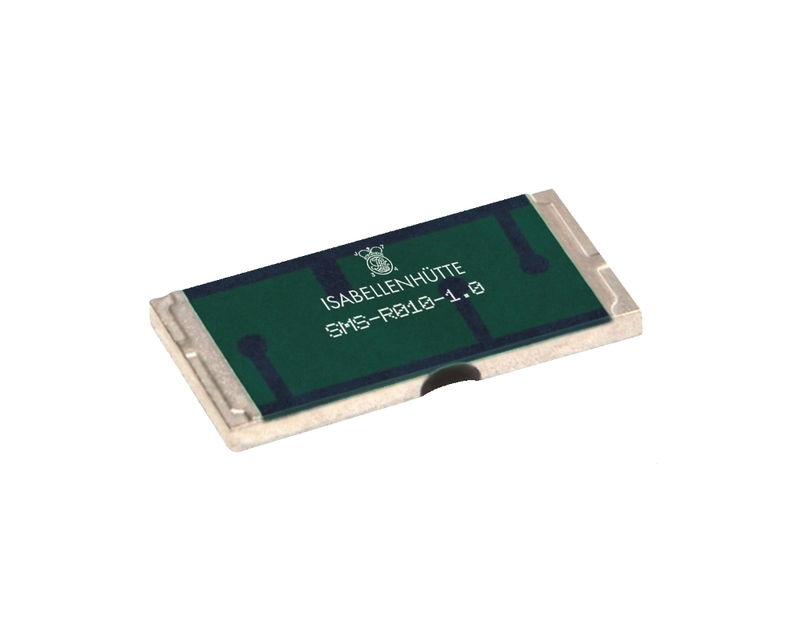 The Isabellenhütte SMS-R000 has a resistance value of less than 0.0002Ω with tin plated cooper terminals and enamel top and bottom2-terminal surface-mount power bridge / jumper with standard solder padsConstant current of up to 100A (DC Curre.. The SMT surface-mount current sensing resistor series from Isabellenhütte offers the designer higher power ratings and low internal temperature rises due to the larger pad termination sizes. The Manganin® alloy resistance element has a resistance range of 0.004Ω to 4.7Ω, TCR of <50 ppm/K for values ≥0.010Ω and <100 ppm/K for values <0.010Ω (between +20°C and +60°C) and offers excellent long term stability. The SMT model offers these.. The SMT-R000 surface-mount series from Isabellenhütte offers a zero ohm 2 terminal power bridge / jumper with up to 100A high current, and allows a track width of up to 3.5mm to run underneath. The Isabellenhütte SMT-R000 has a resistance value of less than 0.0002Ω with tin plated cooper terminals and enamel top and bottom2-terminal surface-mount power bridge / jumper with standard solder padsConstant current of up to 100A (DC Cur.. The SMP surface-mount current sensing resistor series from Isabellenhütte offers the designer higher power ratings and low internal temperature rises due to the larger pad termination sizes. The Manganin® alloy resistance element has a resistance range of 0.005Ω to 1Ω, TC of below 50 ppm/K over the temperature range of +20°C to +60°C and offers excellent long term stability. The SMP model offers these capabilities in a 2010 chip size.2-.. The SMV-PW 4-terminal surface-mount resistor series from Isabellenhütte offers SnPb tinned connections suitable for aviation and aerospace applications. Developed with being ESCC 4001/028 qualified, temperature range of -55°C to +140°C, with a 3W permanent power at 80°C and selective resistance values available are between 0.0033Ω and 1Ω. The SMV-PW series from Isabellenhütte offers high pulse power rating and are suitable for reflow, infrared .. The SMP-PW surface-mount current sensing resistor series from Isabellenhütte offers SnPb tinned connections suitable for aviation and aerospace applications being ESCC 4001/027 qualified. 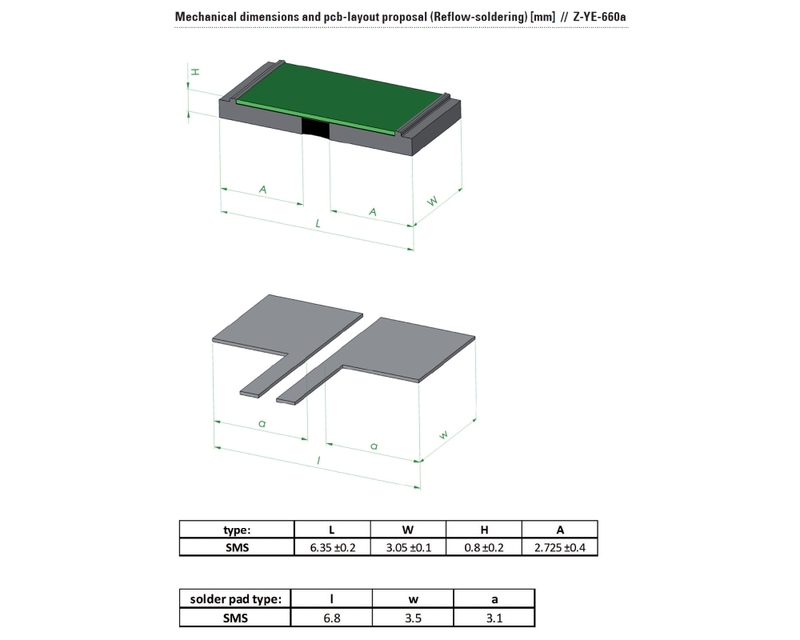 The design for high power ratings and low internal temperature rises due to the larger pad termination sizes. The Manganin® alloy resistance element has a resistance range of 0.005Ω to 1Ω, TC of below 50ppm/K over the temperature range of +20°C to +60°C and o.. The SMT-PW surface-mount current sensing resistor series from Isabellenhütte offers SnPb tinned connections suitable for aviation and aerospace applications being ESCC 4001/027 qualified. Designed for higher power ratings and low internal temperature rises due to the larger pad termination sizes. The Manganin® alloy resistance element has a resistance range of 0.004Ω to 4Ω, TCR of below 50ppm/K over the temperature range (between +20°C and +60..